(1966) Kirk Morris, Gordon Mitchell, Leontine Snell. 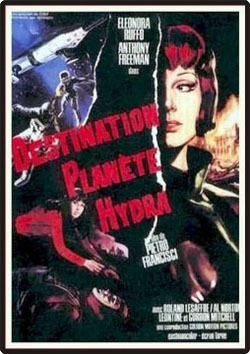 One of the rarest of all '60's sci-fi films. An alien spaceship from the planet Hydra lands on Earth and kidnaps a group of humans. Hibernating robots, aliens with incinerating rays, photon showers, a planet of ape-monsters, and spaceship of skeletons are all featured. Color, 16mm.